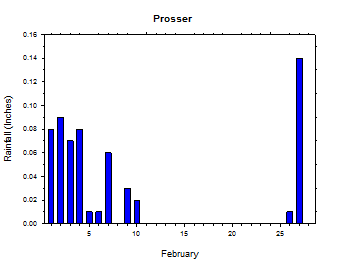 The last time Prosser experienced a calendar month as warm (relative to normal) as February 2015, many of us were still using typewriters and rotary telephones. A total of 300 months passed between the abnormal warmth of January 1990 and last month. The February monthly anomaly was +5.9 degrees overall, and +6.7 degrees for the mean monthly high. Temperatures were particularly warm, especially relative to normal, during the early to middle part of the month. Parts of central Washington recorded highs and lows in the 60s and 40s, respectively, which is nearly 20 degrees above normal for that time of the year. Active and wet weather early in the month gave way to drier and mainly uneventful conditions for much of the middle to latter portion of February. The winter (December to February) was the warmest since 1991/1992, with a mean anomaly of 3.5 degrees. Aside from cold periods around December 1st and January 1st, nearly the entire winter was anomalously warm and largely snow-free. Somewhat stormy weather in December gave way to occasional wet spells interspersed with prolonged dry periods after the New Year. Unfortunately, a lack of correlation between wet and cold weather has meant that the Cascade snow pack is still very low, which could become a greater concern later in the summer. Highlights of the 2015 winter include various temperature extremes and rainfall events. 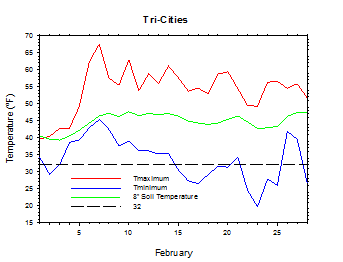 WSU TC soared to 68 degrees on February 7th, and also recorded a balmy low of 47 degrees on December 21st. 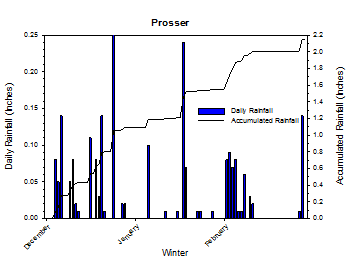 1.27 inches of rain was observed at Pullman on the 19th / 20th of December, and 1.04 inches fell on February 9th. On December 30th, Pullman experienced one of the few cold days of the winter, with a high of just 16 degrees and a low of 4 degrees. Cool temperatures on the 1st quickly rose to well above normal levels by February 6th. Highs and lows were in the 60s and 40s in parts of the state, which is nearly 20 degrees above normal. Rain was recorded on the first eleven days of the month at Mt. Vernon. On the 6th, Mt. Vernon's low temperature was a balmy 54 degrees. 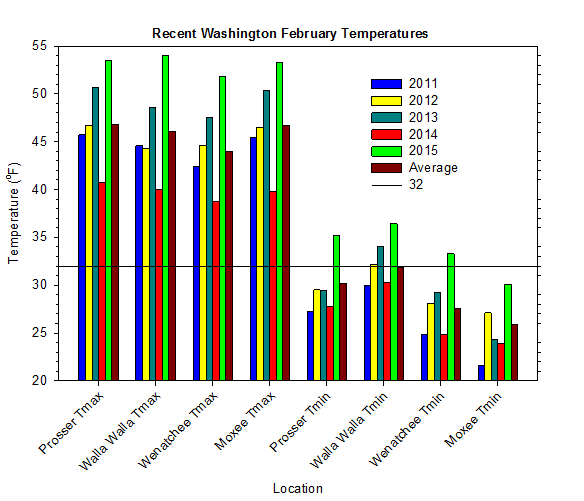 Much drier weather arrived for mid February, although unseasonal day-time warmth persisted. In spite of low temperatures around mid-month decreasing to below freezing east of the Cascades, highs remained mild in the 50s and even 60s. Slightly cooler and wetter conditions returned for late February. Highs were actually cooler than much of the early-mid month period, especially relative to normal, while lows were somewhat variable. 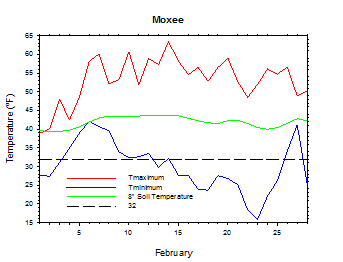 For example, Moxee fell to 16 degrees on the morning of the 23rd, and then climbed to well above freezing a few days later. 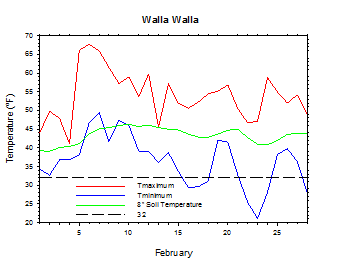 The average February temperature at Prosser (WSU IAREC) was 43.9°F, which is 5.9 degrees (1.7 standard deviations) above average. The average high temperature was 53.5°F, which is 6.7 degrees (1.6 standard deviations) above average. The average low temperature was 35.2°F, which is 5.0 degrees (1.5 standard deviations) above average. The maximum temperature recorded last month was 63.4°F on February 7th, while the coolest daily high was 38.0°F on February 1st. 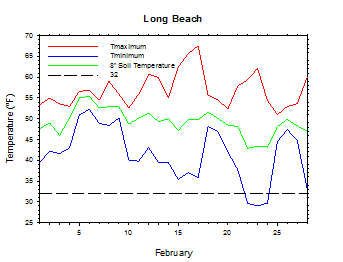 Low temperatures ranged from 48.8°F on February 7th to 22.0°F on February 23rd. Daily average temperatures ranged from 54.0°F on the 7th to 35.7°F on the 23rd. The monthly precipitation total was 0.60 inches. 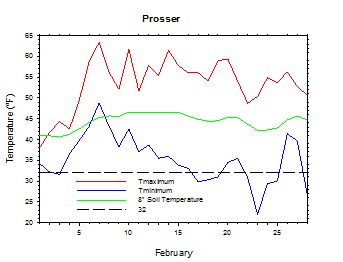 The average wind speed was 4.0 mph, and the average 8 inch soil temperature was 44.4°F. 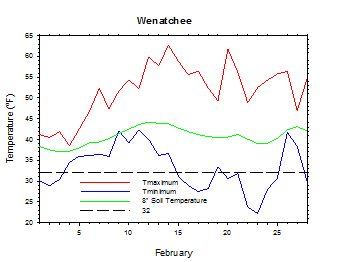 Wenatchee (WSU TFREC) recorded an average temperature of 41.4°F, which is 6.4 degrees above average. February 7th: The temperature at Tri-Cities climbed to 68 degrees. February 9th: 1.04 inches of rain fell at Pullman. February 15th: The temperature at Vancouver peaked at 65 degrees. 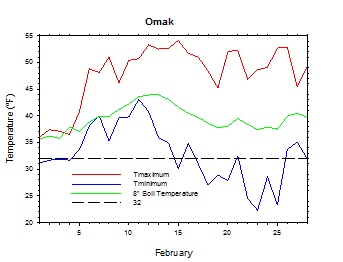 February 23rd: The temperature at Moxee dropped to 16 degrees. Despite a cold and dry beginning and end, most of December was active and mild. Prosser registered a monthly mean high of 42.7 degrees, which is the second warmest on record, and trails only 1999. 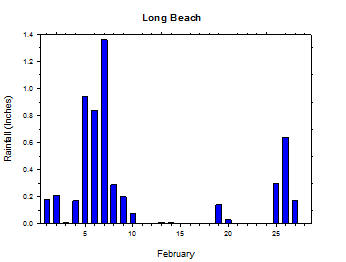 During the period of the 4th to the 29th, Long Beach received rainfall on all but three days, including 1.65 inches on December 10th. Mt. 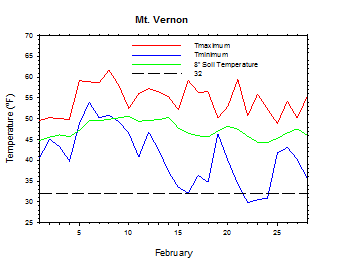 Vernon also reached a high of 66 degrees on the 10th. By contrast, Moxee fell to 7 degrees on December 2nd, while Pullman plunged to 4 degrees on the 30th. January was the coolest winter month, although temperatures were still above normal. Despite periodically wet weather, there were enough days of calm and dry conditions to allow robust inversions to setup for part of the month. Therefore, the abnormal warmth of the mid-winter air mass was not fully realized in the lowlands. The only truly cold air of the month was present in early January, as many locations in eastern Washington began 2015 with highs and lows in the 20s and teens. 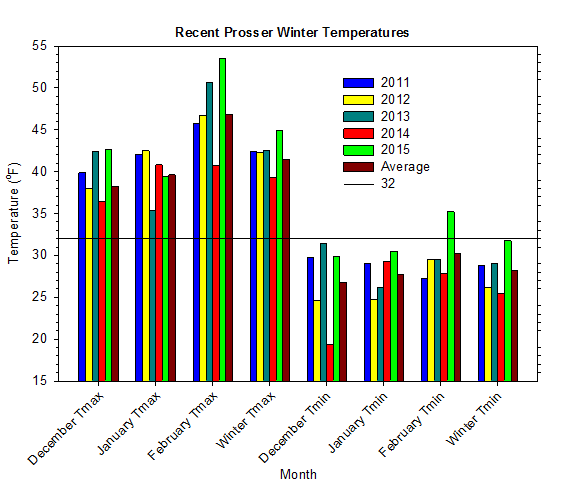 The average winter temperature at Prosser (WSU IAREC) was 38.0°F, which is 3.5 degrees (1.4 standard deviations) above average. The average high temperature was 44.9°F, which is 3.5 degrees (1.3 standard deviations) above average, while the average low temperature was 31.8°F, which is 3.6 degrees (1.4 standard deviations) above average. Daily high temperatures ranged from 63.4°F on February 7th to 25.5°F on January 1st. Low temperatures varied from 48.8°F on February 7th to 10.4°F on December 31st. Daily average temperatures ranged from 54.0°F on February 7th to 17.4°F on December 31st. 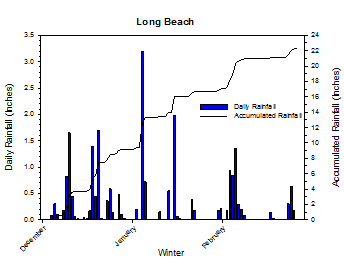 2.15 inches of precipitation fell during the winter season. 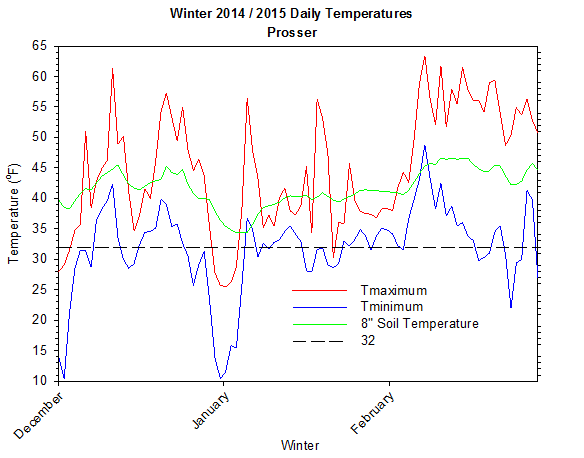 The average wind speed was 3.3 mph, while the average 8 inch soil temperature was 41.7°F. December 2nd: The temperature at Moxee plummeted to 7 degrees. December 10th: The temperature at Mt. Vernon soared to 66 degrees. December 30th: The temperature at Pullman dipped to 4 degrees. 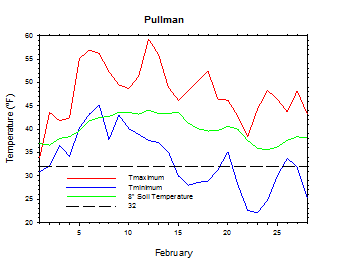 January 5th: The wind gusted to over 45 mph at Pullman. December: Mild and variably active. January: Mild and generally uneventful. It is becoming clear that the mid November arctic blast was devastating for certain canola fields in eastern Washington, as well as a few wheat fields near Odessa. The rapid transition from well above normal to well below normal temperatures early in the cold season led to significant cold damage and crop loss in wind-exposed fields. The lack of an insulating snow cover was particularly harmful to the crop. Otherwise, most of the winter was rather mild and benign. On February 5th, 2014, the temperature at St. Andrews plunged to -11 degrees. According to the Climate Prediction Center (CPC), weak El Niño conditions should persist for much of 2015. Otherwise, above normal temperatures and below normal precipitation are favored for the remainder of 2015.